The Blue Business Plus Credit Card from American Express is arguably American Express' best all-around credit card product. This card offers 2X points on the first $50,000 in purchases each year with no annual fee. I use this card for ALL of my everyday spend (gas, groceries, eating out). I've kept the Blue Business Plus Credit Card in the front of my wallet for close to two years now and I don't see it leaving anytime soon. I signed up for the Platinum Card from American Express for a variety of different reasons, but the one I want to highlight is its return on airfare purchases. The Platinum Card offers 5X points on all flights booked directly with an airline or through American Express Travel. This is the highest return on any bonus category in the industry right now. If I'm buying a plane ticket, you can bet I'm using my Platinum Card. With the merger between Marriott and Starwood nearing completion, the Starwood Preferred Guest Credit Card will eventually be phased out. I wouldn't say I'm 100% loyal to Marriott, but with the addition of the Starwood portfolio it'll be hard NOT to find a good property wherever you go. The Starwood Preferred Guest Credit Card offers 6X points on eligible purchases at participating SPG and Marriott Rewards hotels. When you factor in the bonus points each stay for being a Marriott Rewards Elite member, that's a decent return on each stay. I initially singed up for this card for it's increased sign-up bonus, but held onto it for it's free award night every year on account anniversary (valid at properties costing up to 40,000 points). The annual fee used to be $49, but Chase recently refreshed this card and raised it to $89. For me, I still think it's worth holding onto the card for a free night each year. The World of Hyatt Credit Card also just got a makeover this year. When I signed up for this card a few years ago it offered two free nights at ANY Hyatt property after completing the minimum spend requirements. Obviously I ended up using those for my stay at the Park Hyatt Sydney. The card still offers a free award night every year on account anniversary (valid at category 1-4 properties), but the annual fee jumped to $95. Just like with the IHG Rewards Club Card, I hold onto this one for the free night each year. I signed up for the Hilton Honors American Express Card last year when they were offering an 80,000 point sign-up bonus. Even though that's decreased to 50,000, this card still doesn't have an annual fee. I haven't decided where I'm going to use my points at, but I won't have to cancel this card afterwards which helps my credit score. If you click the link above you'll notice it actually routes you to the AAdvantage Aviator Red World Elite Mastercard. Well long story short, I tried to cancel my card earlier this year and got talked out of it by the agent. 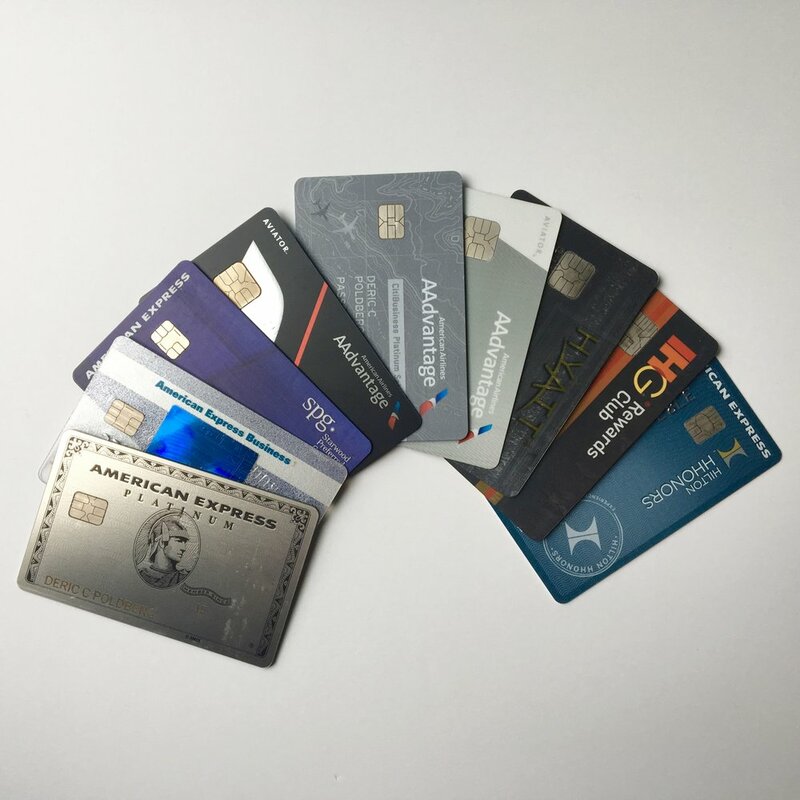 They ended up transferring me to the AAdvantage Aviator Mastercard with no annual fee. Like I said above, it's good for my credit score to hold onto these cards with no annual fee. In my picture above you may have noticed that I have the AAdvantage Aviator Business Mastercard and the CitiBusiness/AAdvantage Platinum Select World Mastercard. While I don't plan on keeping these cards long term, I do plan on to use their increased sign up bonus for a trip later this fall. Right now I've got nine credit cards open and active. I've got one card I typically use for my day-to-day transactions, two I use for their bonus spend categories, and a handful I just hold onto for their long term perks. What do you think of my wallet? How does it compare to yours?